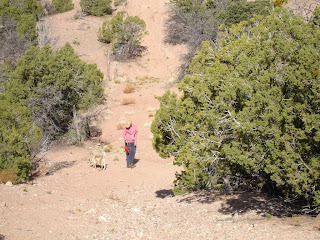 The life-style in the Santa Fe New Mexico area is easy. The hiking isn't. The reason for the former is the attitude. The latter - the altitude. We just spent two weeks there - we know. At seven thousand feet above sea level Santa Fe is the highest state capitol in the U.S.A. - and it has the thinnest air. Presumably the politicians who inhabit the seat of government have been there a while and are immune to the effects of the high elevation. As tourists we hadn't and weren't. You would think thin air would be easier to breathe - being not as bulky as the conventional stuff it seems like it should slide right down into your lungs. But it doesn't. Or if it does it is so deficient in the amount of oxygen that we sea-levelers are used to that our chests feel slightly congested and our breathing organs seem considerably underfed. We find ourselves stopping embarrassingly frequently to simply breathe. And our legs feel heavier much sooner than they really should. Then there's the hydration thing. I don't quite understand why but apparently because the under-oxygenated air is also cool and dry we secretly (i.e. without sweating) lose a lot of bodily water so you've got to hydrate, hydrate, hydrate just to maintain a normal level of internal fluids. Which actually is a good thing because it gives you a legitimate semi-pretend reason to slow down or stop completely (you don't want to spill a precious drop) and take a sip. Fortunately my constantly parching lips were a perpetual reminder to take in more H2O. Overriding these climatic concerns however are the quality of the hikes and the companionship of the co-hikers - this time being Mars (wife and favorite sidekick in all things), Sandy (longtime friend), Kyoko & Ron (former golf partners who now live in Phoenix Arizona), Monica & Bram (daughter-in-law & son), and (for the first time ever) Audrey the dog. Mars, Sandy and I spent the first week of our visit house-and-dog-sitting in the hills around the "The City Different" for J & J, friends of Monica & Bram and the owners of Audrey. The house is New Mexican adobe style - which no longer is made of real adobe bricks - and is set on a piece of land that, were it in grassy Connecticut, would take three landscapers a full day each to cut the lawn on their Hummer-sized riding mowers. 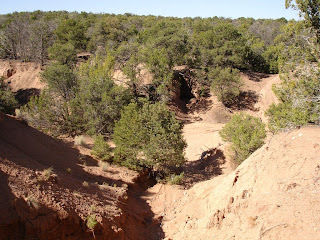 But it's not in New England, Santa Fe has had a year-to-date rainfall of 1.46 inches, so instead of fescue the yard is covered by dry high desert dirt and low pinyon, juniper, and other pines that require little if any moisture. The proximity to the nearest house is about five or six solid Tiger Woods' drives, even in the distance-inducing high altitude air. 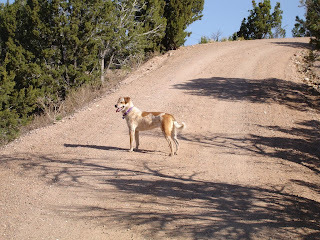 The dog is a fifty-or-so pound mixed shelter recovery dog with no discernible body fat, covered with a coat of dusty white and light brown - the perfect "camo" colors for the New Mexican high desert. Her face is evenly divided into the two colors. The hilltop residence is accessed via a series of unpaved roads and its quasi-isolated landscape gave us ample opportunities to get our altitude legs by hiking on and close to their property. And since one of our daily jobs was to "walk the dog", Audrey was more than glad to show us the area. Audrey is a dog who takes her responsibilities quite seriously. They are (1) guarding the house, (2) greeting home comers, (3) policing the surrounding property, and (4) retrieving the morning Santa Fe New Mexican newspaper. From any one of her several outdoor guard stations Audrey is able to monitor the traffic on the incoming roads and the immediately surrounding desert land; pursue and chase off intruders such as (but probably not limited to) "bunnies" and coyotes; and analyze the vehicle entry paths in order to properly greet all arrivals. To check out the areas farther away from her house Audrey relied on her daily walk with whoever was willing to take her. We walked in the arroyo adjacent to the incoming road, along the barbed wire bounded property line (after crawling through the hazardous fencing), and up and down the unimproved roads. While we were doing this Audrey roamed amid the shrubbery, ditches and dirt piles alongside of our path. In other words, walking with Audrey is not really walking "with" Audrey - instead it's more like being in the vicinity of Audrey while she (a) sniffs under, around, inside, and on top of adjacent bushes, mounds and holes, (b) chases "bunnies" (the normal sight was a blur of rabbit hindquarters scurrying across our path into the pinyon pines pursued by a rapidly accelerating Audrey) and (c) tries to anticipate where we are going by popping up periodically on the trail ahead of us and, when she's wrong, adjusting her own route with a mid-speed jog through the underbrush to position herself up ahead of us once again - something I think the dog trainer Barbara Wodehouse refers to as "following up front". Like the rest of us Audrey needed to hydrate properly on her walks so we always carried and used her "Outward Hound" collapsable water dish. At first I poured the water from my own bottle until it became apparent that she enjoyed drinking from the mouth of that vessel more than from her bowl - so we wrote Audrey's name on it and used it exclusively for her after that. The initial walk with Audrey was a solo effort on my part when we first arrived. We walked down the driveway to the arroyo. She was with me for about the first twenty feet or so. For the next few minutes I foolishly worried that she might wander off ("Hi J & J. I lost your dog within the first half hour.") but quickly decided after several "check-ins" by the dog that she had a better idea of where she was and where I was going than I probably ever would - which she confirmed by shortcutting up the hill in front of the house while I trudged back up the driveway stopping several times to sip water, pretend to look for Audrey, and try to breathe. After that first trek none of us were able to put on our hiking boots or pick up our walking sticks without sending the dog into a paroxysm of ambulatory anticipation consisting of incredibly understated moans and low key bounding and twisting. Beginning with our first full day at the house we took Audrey for a walk every morning around nine o'clock of so. This was preceded two or so hours earlier by my brief trip with her down to the newspaper box to pick up the daily Santa Fe New Mexican. As I approached the yellow container Audrey would be nowhere in sight. As soon as the paper was in my hands she was standing in front of me looking up with her mouth in the ready-to-carry position. The first morning she brought it half way up the driveway hill then left the road and disappeared into the bushes. Fearing that I would have to scramble through the underbrush in search of the morning news I tried to follow. Fortunately I spotted the tabloid about thirty feet off the trail, retrieved it, and carried it the rest of the way home - in my hand. The other days she faithfully carried the gazette up to the front step of the house and left it. On Sunday I removed most of the paper to give her a bite-sized tabloid to sink her teeth into. She seemed to appreciate it. Whenever we left Audrey at the house we were told to say "Guard the house Audrey. Good Girl!" - so we did. And Audrey took her post, sitting on her haunches looking out over the landscape. Normally only one of us gave her the good-by message. On the last day when we left all three of us gave her her orders and rubbed her head and neck. She hesitated for a moment then assumed her sentry position. Here, as reported in the April 19, 1981 New York Times, is what they would like you to believe. Wethersfield is believed to be the oldest town in Connecticut. Settled in 1634, it entered the history books on May 22, 1781, when General George Washington arrived to meet the commander of the French fleet, Count de Rochambeau. Rochambeau had come down from Newport, R. I., to discuss joint strategy for ending the Revolutionary War. Over the next five days - in what has been called the Yorktown Conference - the two planned the final campaign that brought the war to a close at Yorktown, Va., four months later. Now here is the real story. Count de Rochambeau - whose full name was Jean-Baptiste Donatien de Vimeur but preferred to be called "Count" because (a) he thought nobility titles were real "babe magnets" and (b) no one could pronounce all those damn other French names anyway - and General Washington did indeed both come to the town of Wethersfield on that famous day in 1781. And they did meet privately in the yard behind Joseph Webb Junior's house. But they were not really there to see each other at all. Rather they both independently had come to confer with the elders of the Order of the Rubicundus Allium Cepa - one of the many Onion Cults that flourished in the British colonies and the precursor to the modern day Men's Garden Club of Wethersfield. And the topic of their summit was neither military action nor even politics. Instead the General and the Count were there to discuss how they might obtain, for their own personal use, some of the town's world famous Wethersfield Red Onions. It seems that both men had developed an almost obsessive interest in acquiring what Washington liked to call "those sparkling rubies of the foul-smelling plant world" - albeit for widely different reasons. General George, in spite of his fame and renown as a successful militarist, surveyor, and professional wooden tooth model, secretly yearned to be one thing and one thing only - a gentleman gardener. 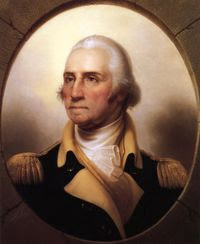 His competition with Thomas Jefferson for horticultural supremacy fueled by the latter's snide references to Washington's animal-ravaged gardens as "Mount Vermin" - had already almost single-handedly scuttled the formation of our young country. Mar. 30. Purple hyacinth begins to bloom. Apr. 6. Narcissus and Puckoon open. 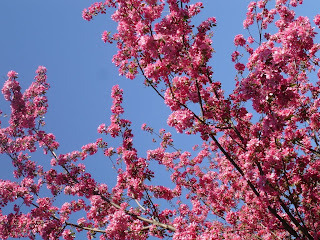 Washington publicly commented that "Jefferson's description of his horticultural triumphs can only lead us to hope that there is much, much more to the pursuit of happiness than old Tom is telling us. And anyway, who but a garden buffoon would boast of a Puckoon?" 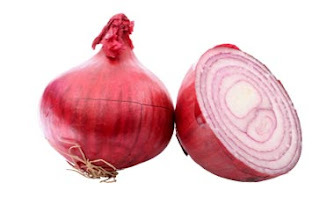 However Washington knew from his onsite garden spies that the one crop Jefferson had been utterly unable to grow was the fabulous Wethersfield Red onion. And it was on that one vegetable that our future first President decided to stake his gardening reputation. 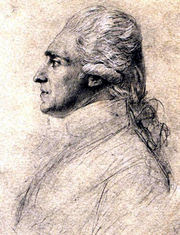 Although Rochambeau also grew flowers and vegetables on his Chateau Briand estate, his interest in the W.R.O. had nothing to do these horticultural pursuits. Instead the Count, accompanied as always on this trip by his wife and twenty-three of his mistresses, had heard that the reddish-purple bulbs were simply irresistible to women as evidenced by (as he would say in his thick French accent) the "larggge num-bare of really hot cheecks" in the town after which the vegetable was named. For obvious reasons both the General and the Count wished to keep the existence of this extraordinary meeting a secret. However the town fathers of Wethersfield recognized the tourism potential of being able to memorialize the event and thus sought to orchestrate an occasion that could be celebrated, for profit, in future years. First they concocted the cover story about war strategizing - even though anyone with any amount of political acumen knew that Rochambeau would never leave the sunny beaches of Newport for anything as mundane as that. Then they set out to create a quiet, dignified welcome that could be endlessly and selfishly exploited until the end of time. Being unsure by which roads the two visitors would be entering the town and what their route would be once they arrived, the leaders decided to cover every last one of the streets and pathways with the scarlet peelings of their pungent smelling town emblem - up to and including the narrow walkway that led into the back yard of the Webb House. Even though the town was small, this still required that the entire harvest of available onions be sacrificed to this herculean decorative task. They were rounded up from every nook, cranny and root cellar of the town. Men, women and children jointly shed their tears as the community pulled together to gather, peel and lay out the welcoming carpet of shiny, scarlet onion skins. Every speck of dirt or grass upon which it was possible that the town's celebrated guests could walk was covered. And all of these roads led to the path into the backyard of the Webb House where the town planners had prepared the piece de resistance of the visit - full-size, lifelike replicas of the General and the Count, in full dress uniforms, shaking hands and smiling in full-photo-op poses. By chance the two traveling parties met just outside of town's south end and preceded together into the center. Along the route the townspeople cheered and showered their visitors with tiny little diced onions. The visiting dignitaries were formally welcomed by the town fathers in front of the Webb House. And they were visibly moved to tears by both the village's overwhelming hospitality and the overpowering aroma of the weep-inducing vegetables. General Washington dismounted his faithful horse "Blueskin" and warmly shook the hands of the Mayor and the other town fathers. The Count leapt down from his mount "Philanderer" and quickly began embracing and kissing the Mayor's young wife. When the Mayor attempted to disconnect Rochambeau from his child-bride in order to greet him himself the Count resisted. As did his wife. When the Mayor finally succeeded in separating them, his missus overpowered "hiz honor" and reeled the Count back in for another round of "official town greetings". Finally a group of six town fathers and the Mayor were able to disengage the couple and drag Rochambeau and the Mayor's wife in opposite directions thus allowing the formal ceremony to begin. At which point it began to rain. And rain. And rain. The precipitation pelted down with a ferocity beyond that which any of the townspeople could remember. And the regal path of onion skins suddenly switched into a slippery slope of slop. The first to fall was the Countess de Rochambeau followed in turn by each of the Count's twenty three mistresses, the last of whom skidded into the Mayor's wife causing her in turn to take out the entire town council and the Mayor himself. Rochambeau began laughing so hard that he also lost his balance and slid into the onion replicas of himself and the General. Then other guests began dropping until the only one left standing was the future first President of the United States. Realizing that there was no opportunity whatsoever to retain any degree of dignity for this ceremony, and mindful of the historic potential of the occasion, Washington took two halfhearted steps forward, willingly lost his footing, and crashed to the ground - his tricorn hat flying to the side. Pulling himself slowly to his feet, with a huge smile on his face, the future Father of our Country said, in his familiar stentorian voice, "Remember this day carefully citizens of Wethersfield. For someday you will be able to say honestly that "George Washington slipped here"." It's six a.m. and I'm wondering why woodpeckers don't get headaches. Because if they did, you see, they wouldn't be pounding so loudly and for so long. Or maybe it's one of those Audubon Singing Bird clocks with a different bird song to mark each hour - and they just chose an incredibly bad sound for six a.m.. It's six o-five a.m. on the same day and, after a brief return to sleep, I realize that it is definitely not a clock and I'm wondering once again why woodpeckers don't get headaches. At both of the above times the event that prompted my musings about migraines was the rapid rat-tat-tat-tat-tat of one of those headstrong birds on one of the neighborhood trees - close enough to clearly hear, far enough away so as to not be visible. Every morning, six a.m., rat-tat-etc. - without fail. 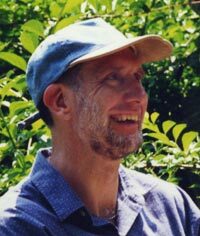 I remember when Mars and I first got married listening to some of our friends talk about the "dumb woodpecker" who woke them up every morning with its incessant tapping on the roof just above their bedroom window. The husband then mentioned this to a neighbor bird-watcher who informed him that the "dumb woodpecker" was not in fact pecking out of pique but rather because it was (apparently with great success) breaking its overnight fast with a protein feast provided within our friends' house covering. They had their roof re-shingled and the early morning drum concert ceased. Over the years we have heard other tales of annoying woodpecker hammering on telephone poles and aluminum gutters. And we've listened to our own share of first hand 'pecker poundings - but never before with the regularity and amplification of this particular one. 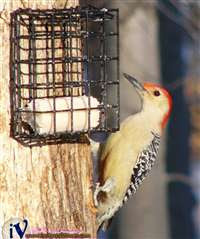 Currently there is a pair of red bellied and several downey woodpeckers that have spent the winter and early spring dining at the suet basket that we have hanging just outside of our family room window. Even in the coldest weather, when the hard white fat was probably frozen solid, these beak-beating visitors made nary a sound at our tallow terminal. These same birds also dine periodically on the dead wood parts of the flowering crab tree on which the feeder hangs - very abstemiously, with minimal if any disruption (maybe five or six nearly inaudible taps), and at a much more decent time of the day. I am absolutely certain that none of these guys are our early morning sleep-breakers. I also suspect that because of their more genteel feeding habits they rarely if ever have headaches. But that six a.m. bark pounder just has to have a skull splitting with pain - right?. Not according to the on-line scientists. All of these birds of the family Picidae, both the dainty eaters and the full-tilt tappers, have evolutionarily protected themselves from pains in the head by having a "stout" bill, a shock-absorbing beak hinge, a strong neck, and a small brain (both in absolute terms and relative to their body size as compared to humans). Other bird families are not similarly equipped and thus presumably not immune to such cranial ailments. Also these birds seem, by their lifestyle, not to be subject to the stressors that, for the human population at least, are the common causes of headaches, namely : anger, muscle tension, missed meals, vigorous exercise and sexual excitement (not tonight, I've already had a headache?). I guess what's true of people is also true of birds - some get headaches and some just give them.